NANGARHAR -- Afghan National Defence and Security Forces (ANDSF) and National Directorate of Security (NDS) personnel are wiping out "Islamic State of Iraq and Syria" (ISIS) fighters from Nangarhar Province. ISIS has been defeated in most areas of the province and only small pockets of fighters remain in very limited mountainous areas, where ANDSF and coalition forces are continuing to fight them, local officials say. Afghan and coalition forces have broken the backbone of ISIS after seizing control of most of Haska Mina and Achin districts, the group's two main strongholds in Nangarhar, in May. Up to 90% of ISIS was demolished in the Maamand and Abdul Khil valleys of Achin District, said Ataullah Khogyani, spokesman for the Nangarhar provincial governor, adding that ISIS members have lost the ability to fight in these areas. Operations are ongoing in Haska Mina District, which was once considered the headquarters of ISIS's Khorasan branch. Over two weeks in late May and early June, Afghan and coalition forces seized two ISIS centres in the Papin area of the district, killing "more than 100 of their militants" and injuring several others, Khogyani told Salaam Times on June 5. "Heavy bombardment" hit the house of ISIS's commander in Nangarhar, Mawlawi Aminullah, on June 4, he said, adding that Aminullah "remained safe, but some of his family members were injured". "Following that, ISIS strongholds were bombarded in Haska Mina District," prompting the terrorist group to threaten immediate "attacks on girls' schools", a local government source told Salaam Times on the condition of anonymity. "[ISIS] cannot fight on the battlefield; therefore, it takes revenge on civilians and on our future generation, and this is a clear example of ISIS's failure," the source said. "ISIS militants have been defeated, and they have lost the ability to fight face to face," Nangarhar Governor Hayatullah Hayat told reporters on June 7. "They were defeated in Achin District, in Pacheragam District. They were defeated in Kot District; they were not able to gain a foothold in Khogyani [District], so we can say that ISIS cannot raise its head again, and for sure it was defeated," he said. Meanwhile, ANDSF June 19 destroyed two ISIS bases in Haska Mina, where two ISIS suicide attacks during Eid ul Fitr -- in Jalalabad and Rodat District -- were planned, according to Khogyani. "Besides the destruction of the two main bases, seven important ISIS members ... who had orchestrated several ISIS attacks and explosions ... were killed," he told Salaam Times. Troops destroyed large quantities of ISIS weapons and ammunition in the early morning operation, according to officials. 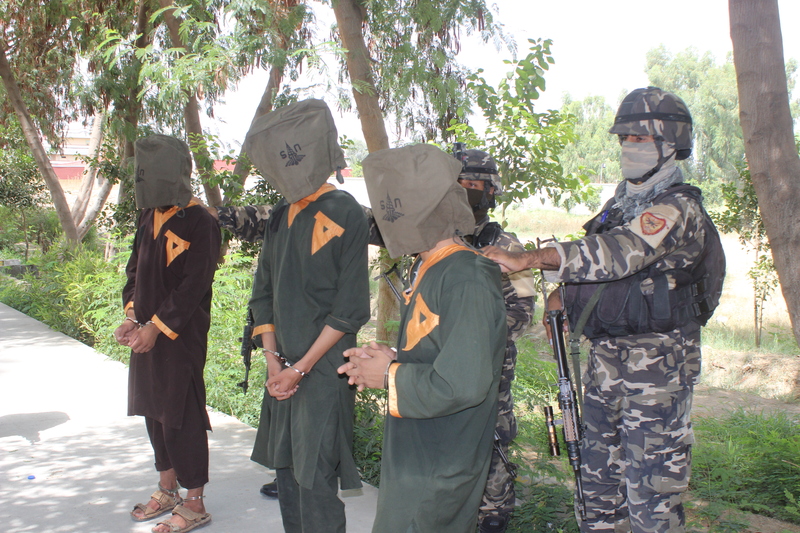 Separately, on June 20, NDS personnel presented to the media five arrested ISIS members who had endangered public security in Jalalabad. "The group was part of an ISIS network in the city involved in kidnapping civil servants and businessmen," Khogyani said. "They were making mines and transporting weapons and were involved in other destructive activities," he said. "With the arrest of these men, the situation in the city will improve remarkably." With ISIS effectively defeated, local officials are shifting their focus to development projects and to the resettlement of internally displaced families. More than 14,000 families have been displaced in Nangarhar since March 2017, according to the Directorate of Refugees and Repatriations of Nangarhar Province. Half of the families have returned to their areas. "Most of the internally displaced persons were displaced for fear of ISIS, as most of them came from Achin, Haska Mina, Pacheragam and Khogyani districts," Najibullah Qayumi, director of the Directorate of Refugees and Repatriations, told Salaam Times. "More than 8,000 families returned to their houses and original residences, and most of the remaining families have received food and cash assistance," he said. Governor Hayat said he has asked the central government for assistance in rebuilding citizens' houses that were destroyed in military and intelligence operations against ISIS. International donors have "pledged $1 million [72 million AFN] to implement projects for farmers in Achin District whose lands and houses were destroyed, so [we will] rebuild their houses and implement projects in this area," Mohammad Idrees Sapi, director of the Counter Narcotics Department of Nangarhar, told Salaam Times. Officials will receive the promised funds in the near future and the project will begin, he said. 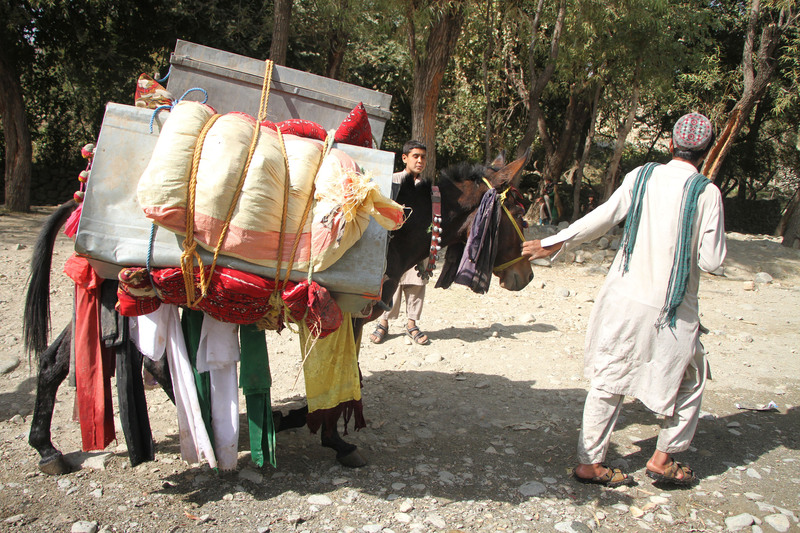 As families tried to reach safer areas, many individuals loaded their personal belongings on donkeys, mules and their own shoulders. The arrest of six militants came after an air strike killed the leader of ISIS in Afghanistan, Abu Saad Arhabi. Afghan forces have confined ISIS to just a small presence in Achin District, enabling 4,000 families to return home, officials say.